Noah Gragson wins 1st Truck Series race with 2017 Martinsville victory. The NASCAR Camping World Truck Series returns to action this weekend after a two-week hiatus to take on Martinsville Speedway on Saturday, March 24 in the Alpha Energy Solutions 250 (2 p.m. ET on FS1, MRN and SiriusXM NASCAR Radio). 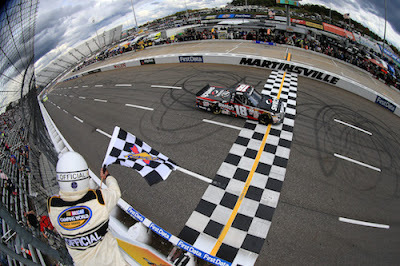 Noah Gragson (Fall) and Chase Elliott (Spring) won the two races at "The Paperclip" in 2017. For Gragson, it was his first career victory and followed up a fourth-place finish in the spring race. It was Elliott’s second career victory in the Camping World Truck Series. His first came in 2013 at Canadian Tire Motorsports Park. Gragson has a chance to go back-to-back at Martinsville as he is entered this weekend in the familiar No. 18 Toyota Tundra for Kyle Busch Motorsports. Elliott is not entered in the NASCAR Camping World Truck Series race.